TDS is on the ground floor of what could be the early stages of the launching of rockets for the small satellite industry in Camden County, Georgia. TDS was one of the Premier Sponsors for a dinner/reception that welcomed Vector Space Systems to Camden County, Ga. The next day, the Tucson-based company successfully launched a test rocket from the proposed Spaceport Camden site in southeastern Georgia, near Florida. It was the first launch out of Spaceport Camden in Georgia, an area TDS serves. The site was originally used by NASA in the 1960s for testing of large solid rocket motors. Now, it’s the site of Vector Space Systems’ successful test rocket launch! Attending the historic launch were TDS’ Roger Tyo, associate manager of Marketing, Frank Holcomb, manager of Field Marketing, and Tom McCabe, manager of State Government Affairs. NASA and several local and state representatives were also on hand to watch the launch. 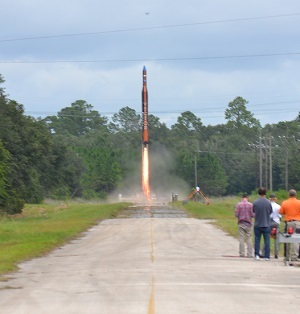 On this Aug. 3 launch, the Vector-R rocket carried a prototype of small-satellite imaging equipment and a biology experiment from a local organization. Jim Cantrell, chief executive of Vector told the Los Angeles Times that by launching at rural locations like Spaceport Camden, our goal of launching rockets at a minimal cost could lead to a “boom in small satellites and result in more launches.” Vector’s mission, he said, is to deliver access for smaller companies looking to launch microsatellites more affordably. The company plans to start sending commercial missions to orbit in 2018. Their goal is to launch 100 Vector-R rockets a year, Cantrell said. 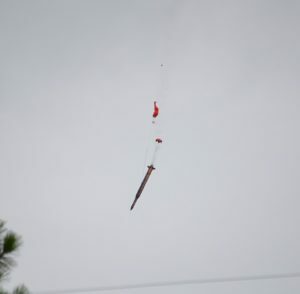 At the Camden County test launch, the Vector-R rocket soared somewhere between 5,000 and 10,000 feet, then returned to the ground beneath a parachute and landed in some trees. Cantrell said the rocket airframe will need to be replaced, but many of its internal components will be reused on future flights. This site is in a remote part of Camden County but is served only by TDS. Fiber and managedIP services are available at the spaceport facility. The Camden County launch site is on the Atlantic Ocean and provides a nearly unrestricted launch range for spacecraft to a wide range of orbits. The Camden County Board of Supervisors developed a paper on Why Develop a Spaceport in Camden? Here’s a link to the actual launch.